Rising inequality in the US isn’t new; Declining inequality globally is. Scratch just beneath the surface of many daily problems, and you’ll find income inequality is a contributing factor, if not the chief culprit. Whether its concentrated poverty, soaring housing costs, disparities in educational attainment and public services, or the nation’s political divide, it all seems related to growing inequality. A new chart published earlier this month in the New York Times brings the magnitude of the inequality problem into sharp focus. Based on work by Thomas Piketty and his colleagues, it shows how much incomes have changed at every point in the income distribution. As the chart makes plain, income gains in the US have been highly concentrated in the top 1 percent of the population (and within that group, within the top 0.001 percent). This chart is from an excellent anlaysis published by Vox which explains Piketty’s research in more detail). What the chart shows is that for those in the bottom quintile of the income distribution (under 20 percent), gains in real income, prior to taxes, were negative between 1980 and 2014; only the net effect of tax changes got their income to zero change. But while sharply detailed and shocking, this isn’t really new. 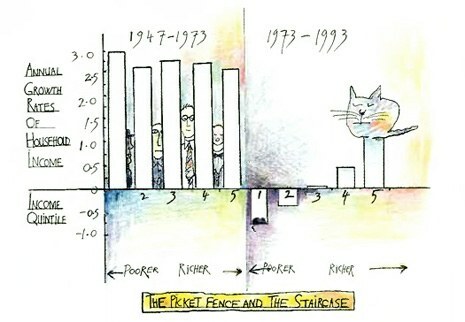 A quarter of a century ago (1992), then relatively obscure though outspoken academic economist Paul Krugman wrote an article (“The rich, the right, and the facts”) for The American Prospect contrasting what he called the “the picket fence and the staircase.” Though much cruder that the measures generated by Piketty, Krugman’s computations show the same trend. While during the growth period of the 1945 to 1973 period the growth in US incomes resembled a picket fence (each quintile of income seeing roughly the same percentage increase), after 1980, the growth in incomes resembled a steep staircase (with income growing faster for those with the highest incomes). Its easy to imagine that the same processes are at work globally. Its still the case that global income is highly unequally distributed, and those in Europe and North America have a disproportionate share of world income. And while still highly unequal, the global distribution of income has become much less skewed in the past couple of decades. And to contrast with Piketty’s curve and Krugman’s picket fence and staircase, we have Branko’s elephant. Drawn by economist Branko Milanovic, this chart depicts the global distribution of income in exactly the way that the other charts depict US income gains. 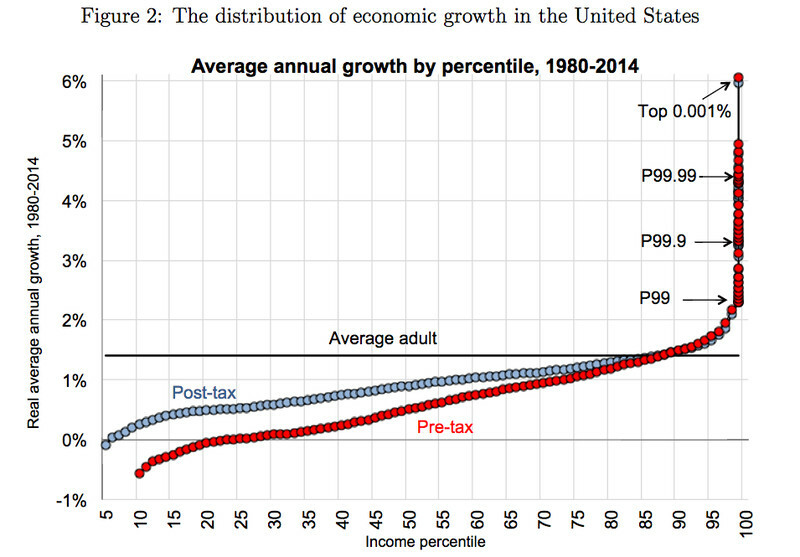 The horizontal axis corresponds to average income and the vertical axis measures the percentage increase in income between 1988 and 2008. The elephant shape of the curve shows low gains among the very poorest of the global poor (at the far left), sizable gains for those in the 10th through 70th percentiles of the global distribution of income, and a sharp falling off of gains for those in the 75th through 90th percentiles–with actual declines in income for some near the 80th percentile. 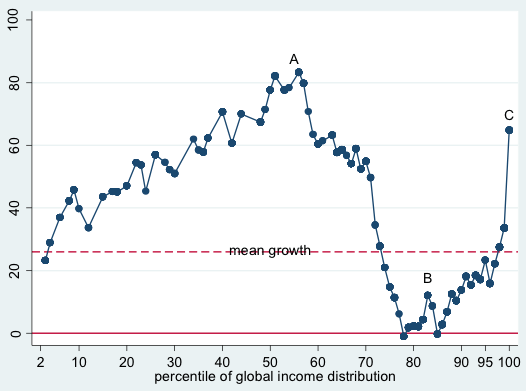 The elephant’s soaring trunk (C) is the income gains of the the top 1% and 5% of the global distribution. Branko’s elephant contrasts the startling improvements in measured income, led by growth in Asia, and particularly the development of India and China. Those in the middle of the income distribution actually recorded the fastest income gains. The residents of these countries have seen their real incomes increase substantially in the past two decades. And as Milanovic points out, this development has produced the first decline in global income inequality since the industrial revolution began. The gains at the very top (the tip of the trunk) reflect the superstar rich, throughout the world. And the fall off in the 85th percentile (the drooping bottom of the trunk at B) reflects the plight of those in advanced economies who haven’t benefited from globalization and technological change. These include the bottom half of the income distribution in many “developed” economies, and many modestly educated workers in the US. So when it comes to inequality, there’s bad news and good news here. The concentration of income among the top 1 percent is real and growing, both in the US and globally. But its also the case that a huge fraction of the world’s population enjoys a higher income level today than two decades ago, and as a result, the global distribution of income is less skewed (at least for the bottom 95 percent of the population). And its important to note that the inequality problem isn’t playing out the same way everywhere: some nations have experienced much less of an increase in inequality than the US. Differences in national policies and institutions, play a critical role in determining income distributions.